As millions of people turned out to polling places across the country on Election Day, hundreds of Chicago teens got their first taste of the Democratic process, volunteering to work as election judges at sites throughout the city. 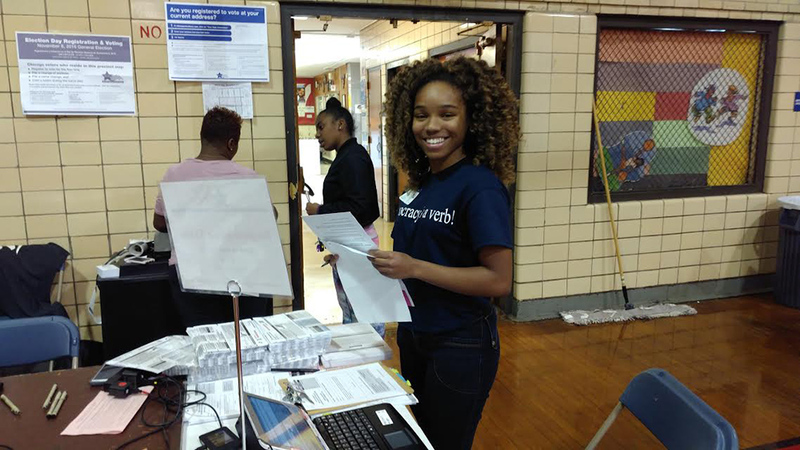 Mikva Challenge – a Chicago-based nonpartisan nonprofit that works to get high school students interested in public service – organized teens with the city’s Board of Election Commissioners to help set up and run polling sites from before sunup until after sundown. Approximately 7,000 students and 145 teachers from 115 Chicago-area schools take part in the Mikva Challenge throughout the year. According to organizational data, more than 450 Mikva students volunteered for political campaigns during the 2012 presidential election. This year, Goldenstein estimates more than 1,670 private and Chicago Public Schools students took part as election judges across the city. Among them were Sofie De La O, Kristie Chavez and Diana Salgado – a trio of seniors from Thomas Kelly High School in Brighton Park. To participate, the students must be juniors or seniors with a 3.0 or better GPA, and U.S. citizens with the ability to read, write and speak English. Chavez, Salgado and De La O each worked from around 5 a.m. until after polls closed at 7 p.m. Tuesday, splitting time between the voter registration table, looking up voters through e-poll books, handing out ballots and making sure finished ballots were collected correctly. Mikva Challenge typically recruits students through their high school teachers, who help them fill out applications. But now that the election board has streamlined the process and made applications available online, Goldenstein said more and more students are taking advantage of the opportunity on their own. In addition to helping organize equipment and running ballots, Goldenstein said many of the teens involved speak two or even three languages, which has been a crucial asset in assisting non-English speaking voters. The goal of the Mikva Challenge, Goldenstein said, is getting youth involved early in the political process so they will stay active throughout their lives. Working as judges does just that, helping to “demystify” the election process and put teens in a place where they have more expertise and less trepidation about voting. Nov. 1: Clinton’s emails and Trump’s taxes are dogging their respective campaigns. A look at the latest developments in the presidential election. Nov. 8: The city's Board of Elections Commissioners is considering going to court to extend the voting deadline at multiple polling sites after some opened as much as an hour late this morning.